In the past two decades, cell phones have evolved from relatively simple communication devices into mobile supercomputers—an evolution made possible by ever-shrinking microprocessors. But as functionality has increased, so has the challenge of providing reliable micro-scale power sources to support that functionality. 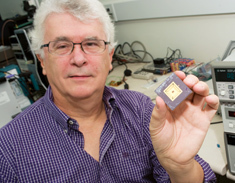 Ten years ago, Electrical Engineering and Computer Science Professor Trevor Mudge accepted the challenge by shifting his focus from the development of high-performance computers to the pursuit of new technologies for ultra-low-power computing. "There were lots of reasons for my decision," he says. "One is the obvious environmental benefit of very low-energy technology. There's also the issue of assuring both reliability and manufacturability of components as we move into the realm of micro-components. And then, of course, there's the inherent appeal of tackling a difficult problem—the building of low-energy architectures." In one of his earliest energy-related projects, funded in part by the National Science Foundation (NSF), Mudge studied ways to improve the energy efficiency of computer processors used in cell phones. "My goal, then and now, is to push ever further into the energy-efficient space," he says, "to find ways of increasing performance with less energy." It's a goal shared by many businesses, including ARM Limited, a UK-based company that licenses intellectual property for energy-efficient semiconductors used in mobile handsets and across a wide range of other applications. Five years ago, at the invitation of his former graduate student and current ARM Vice President of Research and Development Krisztian Flautner, Mudge and U-M colleagues David Blaauw, Scott Mahlke, Dennis Sylvester, and Thomas Wenisch entered into a five-year, $5 million research partnership with the company. One of the team's earliest projects resulted in an ARM product known as the Intelligent Energy Manager (IEM) system, a technology that enables mobile phones to automatically self-adjust their battery usage. More recently, Mudge, Blaauw and Sylvester invented a novel interconnect technology that allows dozens of microprocessors to talk to one another in an energy-efficient manner on a single chip. This enabling technology will reduce the power and cost of computers used in the "cloud." It will also help ARM leverage its low-power expertise to compete in a new market. Overall, the outcomes have been so impressive—nearly 40 patents and a spinoff company—that ARM has opted to renew the contract. As Flautner notes, "Our alliance with the University of Michigan has been mutually beneficial, leading to significant advances in the high-performance, low-power processing platforms that are essential to the next generation of micro- computers." Trevor Mudge is co-founder of the U-M's Advanced Computer Architecture Lab (ACAL). Established in 1985 as a research unit of the Electrical Engineering and Computer Science Department, the lab has an annual research budget exceeding $4 million and serves as the focal point for interdisciplinary research in the theory, design, programming, and applications of advanced computer systems. Over the past two decades, ACAL researchers have made pioneering contributions to the design of high-performance computer systems.